NY city neurologists and physiatrist NYDNR is considerin NYDNR to be number one clinic for treatment of neurological balance disorders. We have been a leader in this field since the acquisition of very first private CAREN ( computer assisted rehabilitation environment ) in US. Human balance relies on information coming from a variety of different nerve cells located in the different regions of the human nervous system. Once this information is received and processed a motor response (movement, posture, etc…) is generated. To put it simply our ability to move is largely dependent on perception or ability to process sensory information. The ability to balance is one of the most important prerequisites for human movement. Even the slight loss of balance is devastating when there is any disease or dysfunction of the nervous and/or musculoskeletal systems, especially when it comes to walking and stabilizing the spine during dynamic postural control. The ability to process and integrate information from the vestibular system, ocular system(vision), proprioception, and posture compose balance. Most of the postural information we perceive is derived from our ability to see. Vision monitors the position of limbs in the 3 dimensional space. The ability to maintain dynamic alignment of the head, spine, and pelvis in relation to gravity is very important in maintaining balance. The vestibular system, also known as cochlea-vestibular system, in conjunction with the cerebellum synchronizes eye movement to keep images on the retina during head movements. This vestibuloocular reflex controls balance. Sensory information arriving from the plantar soles, foot, and ankle joints combined with all the other sensory inputs provides information to the central nervous system. This information tells the body at each instant where it is in space. Additional information from spindle receptors in foot and leg muscles provides steering and control of balance. Research shows that initial balance recovery is a strong predictor for disability after the stroke. The research also suggests that normal sensory integration is critical for balance recovery after stroke. The central nervous system is responsible for processing and integrating the information that is supplied through peripheral sensory receptors. Reestablishing central processing and integration of sensory information is essential for successful stroke balance recovery. 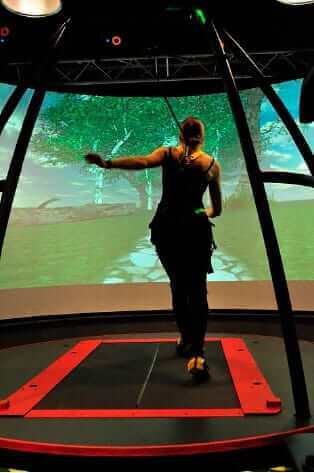 We are proudly the first virtual reality center for stroke rehabilitation in New York City. Our CAREN (Computer Assisted Rehabilitation Environment) system is the most advanced stroke rehabilitation technology in the world. With the combination of our advanced technologies and unique rehabilitative approaches we are the most advanced private neurorehab center in New York City. CAREN is a versatile, multi sensory virtual reality system for rehabilitation of neurological disorders affecting human locomotion (walking), balance, vestibular system, and the ability to integrate and process sensory information. The system works in real-time and enables the creation of a variety of sensory experiences in a controlled and repeatable immersive environment by using a combination of different virtual environment principals and specialized integrative hardware such as 6 degrees of freedom motion platform, 180 degree screen, and motion capture system. VR (Virtual Reality) is one of the most innovative, effective, evidence based and most recent of medical technologies which has begun to be used as an assessment and treatment tool in the rehabilitation of neurological disorders. Disorders such as stroke, parkinson, different types of neuropathies, traumatic brain damage (TBI), concussion, and balance and vestibular disorders. Extensive research data shows that task-specific training provided by VR (Virtual Reality) is much more effective versus conventional or non-specific training. Studies show that rehabilitation outcomes are better when a patient is treated in an immersive environment and practice is task- oriented and repeatable. The brain remodels itself in response to practice – this is called experience dependent plasticity. The brain changes (neuroplasticity) in response to a skill acquisition process not simply a motor repetition like conventional physical therapy. CAREN is a rehabilitative environment in which movement dysfunction can be alleviated and movement patterns can be optimized. CAREN’s uniqueness comes from using variety of different sensory feedbacks in real time simultaneously. This enhances the effect of processing the multi-sensory input which is then converted for optimized motor perceptual output. The success of this innovative rehabilitation technology lies in the ability of the software to process, measure, and monitor human movement behavior in real time. This enables diagnosis of movement faults not visible to the human eye to be registered in real time. Thus allowing real time correction through feedback and feed forward mechanisms utilized by the patient’s ability to correct his movement for the first time in rehabilitation science. Also the system itself is built to give feed back to the patient based on individual data computed. The patient is also receiving the input from the operator who is trained to operate and interpret the data and therefore can also change the output of the system based on patient need. The effect achieved by training on CAREN is not possible to achieve with conventional stroke physical therapy. What Are Other Stroke Rehabilitation Treatments Available? At Dynamic Neuromuscular Rehabilitation we use another unique approach available only with us in NYC. Vojta therapy aka reflex locomotion is a neuro rehabilitative approach commonly used in Europe for treatment of patients with neurological diseases. Vojta therapy improves sensory motor as well respiratory and bowel and bladder function in patients affected by stroke. Vojta therapy is conducted in developmental positions in which global motor patterns are manually stimulated by vector specific pressure to zones of support. This stimulation produces subconscious automatic motor response which allows rewiring of affected neurons to occur due to neuro plasticity enhancement by eliciting genetic prewired motor reflexes. Vojta therapy is evidence based European approach commonly used in German speaking countries for stroke rehabilitation.